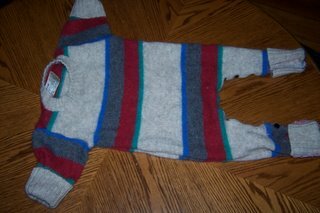 I had a sweater that I thought was wool. I tossed it in the washer but it didn't felt much. 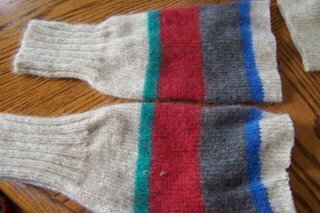 Turns out it is only 70% wool. I decided to try to make my dd an outfit with it. This is a HUGE sweater. I am not at all on the slim side and I could fit 2 or 3 of me in this. The sleeper is one that still fits my dd it is size 9 months and she is 15 months old but only 18 pounds. 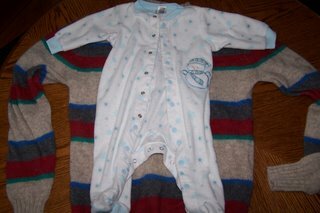 The sweater is about 3 inches longer than the sleeper. I cut off the arms and used a sleeper as a guide for the crotch. 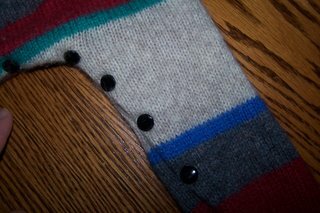 I used the waist of sweater to make the leg cuff. I cut off the end of the arms (used the sleeper for the size measurement). 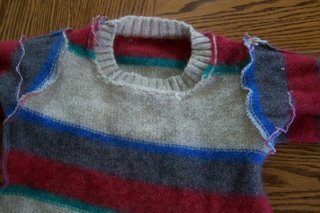 I cut the shoulder on the sweater down to the size the sleeper was. I did take the neck in a tiny bit (my dd has a large head). I want to learn how to use my serger so my stitches might not look nice I am still learning how it works. A sewing machine would have worked. 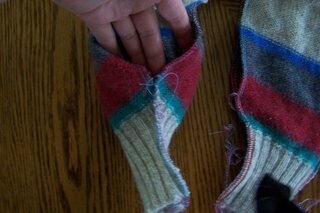 I surged the along the open legs to keep it from fraying The only spot I attached the front to back in the legs was the bottom cuffs. 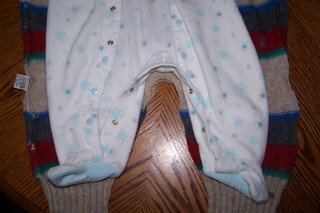 I can get my dd in and out to put on potty or diaper change easy with the cuffs together. I turned in the serged edges (enough to stick the snaps in 2 layers.) I added snaps to close the legs. I turned up the cuffs on the wrist and ankles (until my dd grows some). I am sorry my pictures are so dark. It was dark and raining when I did this. My dd was taking a nap not far from me so I didn't turn on the lights. I used the flash but the pictures still look kind of dark. 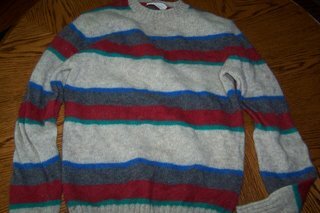 It looks a little boyish to me but it will work great when winter hits. The floors in our house are always cold. What a creative idea!! I love to knit, but haven't taken on felting yet!!! I just love that little sleeper!! oh my gosh, that is the cutest thing yet!